One has hoped that an interested competent person might have made measurements of some samples from Amidon to give full characteristic curves, it isn’t that hard. 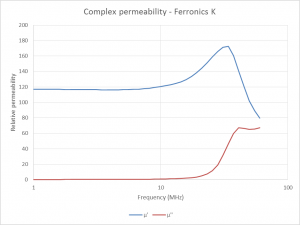 Ferronics describe their K mix as a cobalt-nickel ferrite. Above are Ferronics curves, and you might at first think that since they have characterised their K material to this level of detail that they have good knowledge of product. 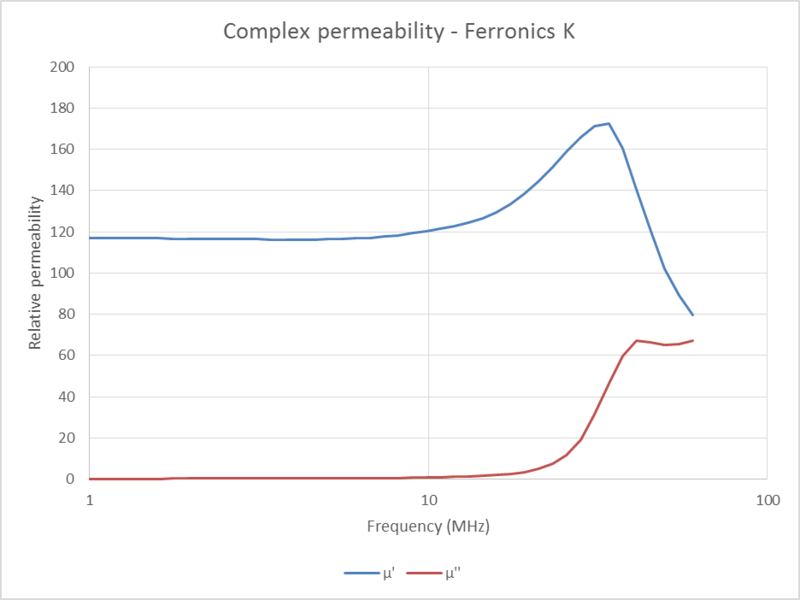 Above is the Ferronics-K data converted to complex permeability, a more common format. 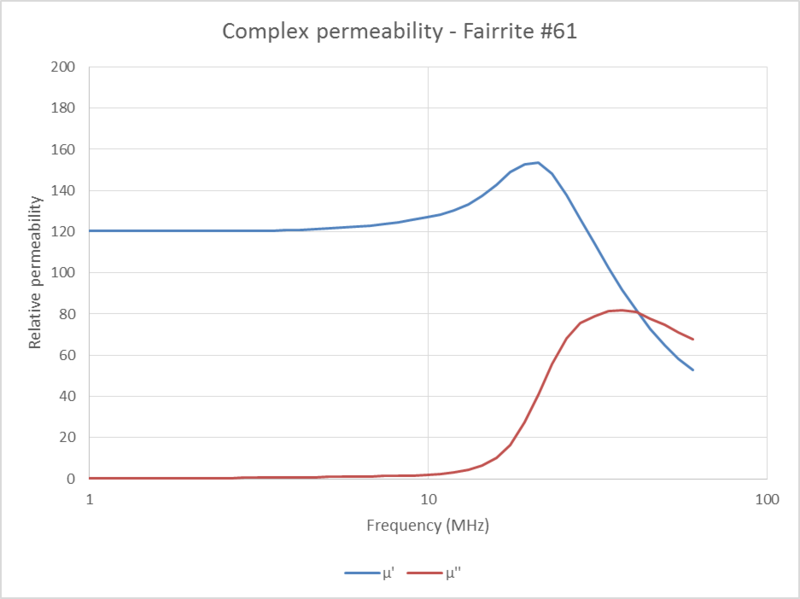 The above curves for Fairrite-61 (nickel-zinc ferrite), fairly similar to the Ferronics-K curves, so one might conclude that although they are not identical, they are fairly similar in behaviour. 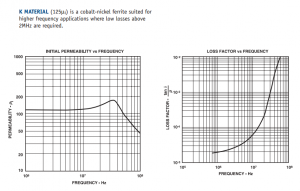 As mentioned, Amidon does not show characteristic curves for their mix K products on their website. Though I say “their product”, it is probably manufactured by another party, unknown. 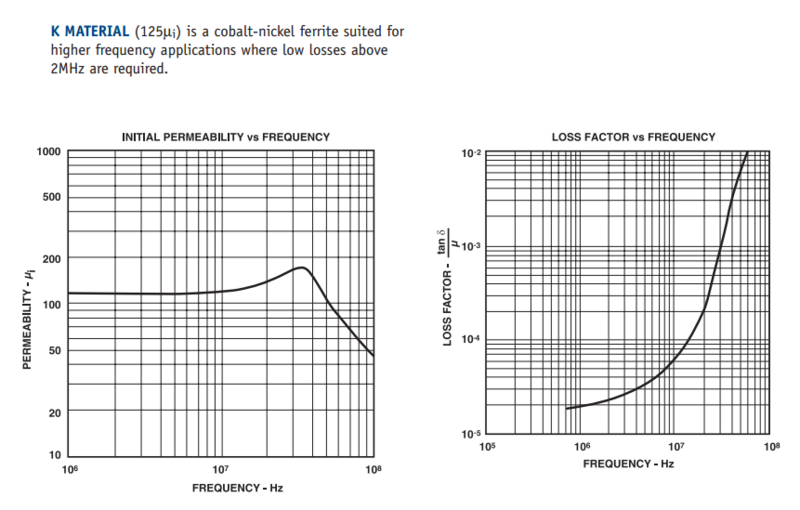 The volume resistivity given is typical of nickel-zinc ferrite, as is µi in range. The short form characteristics are somewhat similar to TDK K5 and later SY20 materials. It has been suggested that Amidon-K is very similar to Fairrite-52 (nickel-zinc with µi=250) but without seeing credible Amidon-K detailed curves, I cannot comment. I would be willing to crunch the numbers on a measurement taken of an Amidon-K product. I must be sure it is recent Amidon product, and the measurements must be from a reliable, quality one or two port VNA or equivalent antenna analyser. I do not regard any AIM products currently meets the requirement. 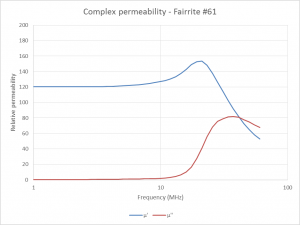 It seems there are at least two ferrite products in the market labelled as K mix with significantly different characteristics. When buying baluns advertised as using the magic K mix, which of these two characteristics is the magic one, and which are you buying.